When Slash released his eponymous debut solo album in 2010, a project that featured collaborations with his favorite singers, the guitarist asked artist Ron English to collaborate with him on the cover. Ron interpreted Slash’s iconic skull with a top hat using Ron's unique glowing color technique in a boudoir atmosphere complete with guitar/derriere crossbones. 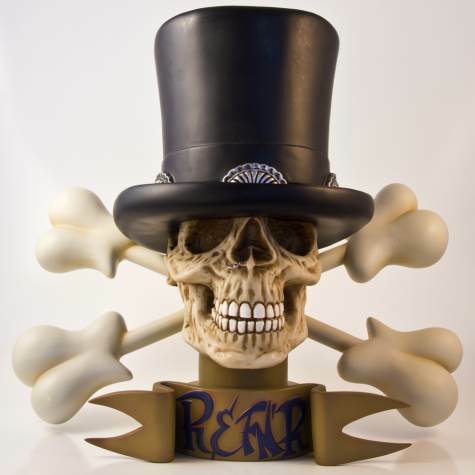 In response to the popularity of the album artwork, Ron English and Slash have worked together to create a limited edition fiberglass bust of the now iconic image. In collaboration with Garage Works, the prestigious sculpture house in Hong Kong, the english Slash bust is being released in a limited edition of 10, each signed and numbered by Ron English and Slash. The price is listed at $7,500 – for more information, visit Popaganda here. Slash is currently at work on material for his third solo release.